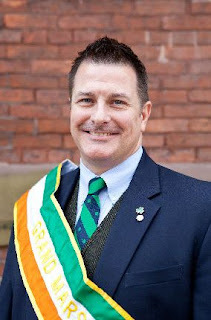 York Saint Patrick's Day Parade: Bryan Tate named 2013 Parade Grand Marshal! Bryan Tate, Vice President of Philanthropy for the York County Community Foundation, was named Grand Marshal of the 2013 York St. Patrick's Day Parade. Sincere thanks to Central Market York for hosting our press conference this year, and to Cushla and Josh Srour of Irish Blessing for providing music. Our thanks also to Digital Ephemera Photography and The Susquehanna Photographic for their assistance in photographing the event.